taupok | eat. drink. cook. travel. One of Mum’s friends once made a dry version of laksa for a potluck. It made so much sense to do it without the liquid for easy luggability. It was really yummy, so I had to recreate a version so that DC could try it. It was incredibly easy, although it requires quite a bit of effort in chopping everything up. The picture didn’t come out so good partly because I was trying out a new camera and partly because I lost patience with the chopping. Get some help with the cutting if you can. If not, don’t worry, it tastes much better than it looks! Pound the soaked shrimp using a mortar and pestle together with the belachan, shallots, garlic and a handful of laksa leaves. Fry the dried shrimp in hot oil till crisp, taking care to put them all in at the same time. Remove promptly from the oil as the shrimp burn easily. Set aside on paper towels to absorb the excess oil. In the same oil, fry the pounded paste of shrimp, belachan, shallots and garlic with the lemongrass and galangal slices till fragrant, about 2 minutes on low. Pour in the laksa paste and fry till fragrant or till you start choking from the pungent chilli smell (whichever comes first). Remember to turn on the fan extractor if you have one. Still, it’s pretty much guaranteed that your whole house will reek of laksa for days. Remove the lemongrass and galangal, discard. Add the coconut milk and stir till you get a thick but fairly runny paste. Stir in the taupok and beansprouts, making sure to incorporate fully before adding in the next ingredient, then finally the noodles. Check the seasoning, adding fish sauce to taste. Garnish with cucumber shreds, chopped laksa leaves and crispy dried shrimp. 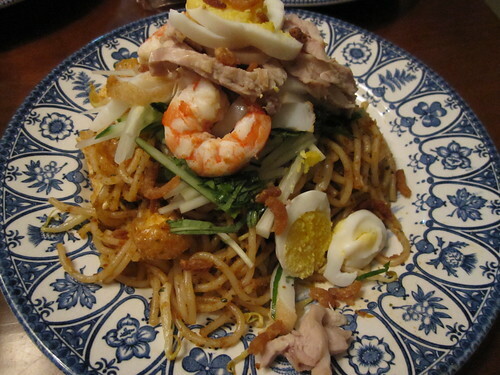 Serve with fish cake, prawns, chicken and boiled egg slices on the side for everyone to help themselves. 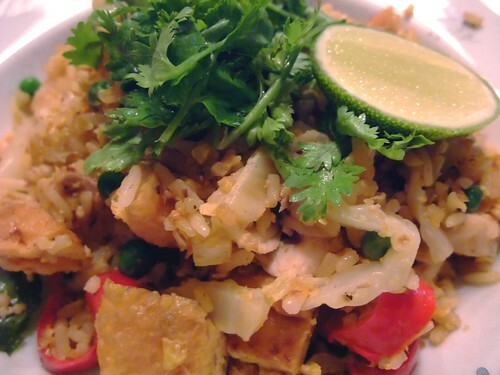 I see fried rice as a way to use up leftovers yet not feel like I’m eating old stale food. When I cook rice, I always make sure to cook more so that if I ever want to make fried rice, day old rice is ready for frying. Don’t even bother trying this with fresh rice. It’ll just be soggy and spoil the texture. Normally I like to start with some kind of rempah base, usually from a packet. A lot of times it’s tomyam or green curry. The day I made this, I ran out of my favourite green curry paste so I had to plump for some remnants of a pack of red curry paste. Other stuff languishing in the fridge were leftover tinned sardines in oil, a chunk of wong bok, a few limp red chillis, and some coriander. From the freezer came petit pois, chicken breast and kaffir lime leaves. Add to that some taupok and fresh lime and dinner is sorted. Heat 2 tbsp oil in a wok and fluff the rice. Crack the eggs directly into the wok and toss in the rice. Wait a few seconds for the egg to set slightly then stir-fry the rice till it turns golden and the grains separate. Set aside. Heat the remaining oil in a wok and fry the garlic, shallot and ginger till fragrant. Add the red curry paste and kaffir lime leaves, keep frying till fragrant. Add in the chicken and keep stirring. Just before the chicken is cooked, toss in the sardines, tauok, petit pois and chillis, stir for a bit more. Finally, stir in the reserved eggy rice and season with fish sauce to taste. Serve garnished with coriander and lime wedges.